Gluten free. Suitable for vegetarians. 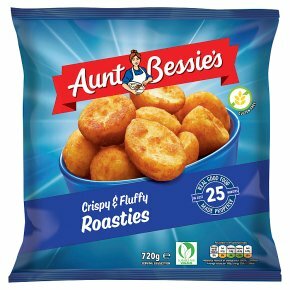 Roasties "Perfectly crunchy, crispy and fluffy, my delicious Roasties are so easy to cook, you can enjoy them any time. Why not get everyone together and impress guests with my recipe for crispy golden rosemary & garlic Roasties." Cook from Frozen. Once defrosted do not refreeze.All cooking appliances vary, the following is a guideline.Take Care - product will be hot.Conventional Oven: Preheat oven to 230°C, 450°F, Gas Mark 8. 30 minutesFan Assisted Oven: Preheat oven to 210°C, 410°F. 30 minutesRemove all packaging. Spread the Roast Potatoes evenly on a baking tray with upturned edges. Place the tray in the centre of a preheated oven and cook for 30 minutes until crisps and golden. Turn the Roast Potatoes at least once during cooking to ensure an even crispness.Ensure the Roast Potatoes are piping hot before serving.Not suitable for microwave cooking.For fan assisted and miniature ovens, refer to manufacturer's handbook for guidelines.Please ensure product is piping hot before serving.Serve immediately.